You may have heard that baking soda is the best thing for removing bad odors from a refrigerator. It is certainly a traditional method that many have relied on in the past. However Activated Charcoal is a much more effective material when it comes to combating odors and keeping homes, cars and many other places smelling fresh. Historically, Activated Charcoal products have not been easily available to consumers, but that is now changing. To understand the difference between these two materials, let’s dig deeper and understand why this is the case. • Baking soda makes a non- fluoride toothpaste if mixed with hydrogen peroxide. • You can use a baking soda and water paste as a body scrub. • For ultra-clean hair, mix baking soda with your shampoo. • A very dilute solution of baking soda and water makes an effective garden fungicide. • Baking soda can be used in dry chemical fire extinguishers. • Baking soda is used in the leather industry to neutralize acidic tanning agents. • Woollen and silk fabrics are treated with baking soda and it is used for fabric dyes. • Baking soda can be used to biological treat waste water. • Baking soda can be a very effective swimming pool cleaning agent. Does baking soda absorb smells? Baking soda does react with some odor-causing compounds in a way that reduces odors. However, it doesn’t react with all odor-causing compounds and has such a small surface area that its effectiveness is limited. Why is activated charcoal better for odor-elimination? Activated charcoal (or activated carbon) is one of the most effective odor absorbing materials – actually it adsorbs. This is because of its huge surface area, which allows for millions of micro pockets and pores. These micro pockets and pores catch smells and lock them in like a vacuum cleaner catches dust. Despite its many interesting uses, baking soda has been proven to be a less effective odor eliminator than activated charcoal. This Food Network segment from ‘The Food Detective’ confirms this finding. Note the product shown at the end of the segment, it is Innofresh’s very popular FRIDGE IT activated carbon absorber. 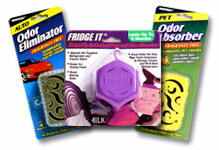 We know that eliminating bad odors is better than covering them up. We know that both baking soda and activated charcoal (or activated carbon) can react with odor-causing compounds in a way that reduces odors. But activated charcoal (or activated carbon) has been proven to be far more efficient and effective at odor elimination than baking soda.